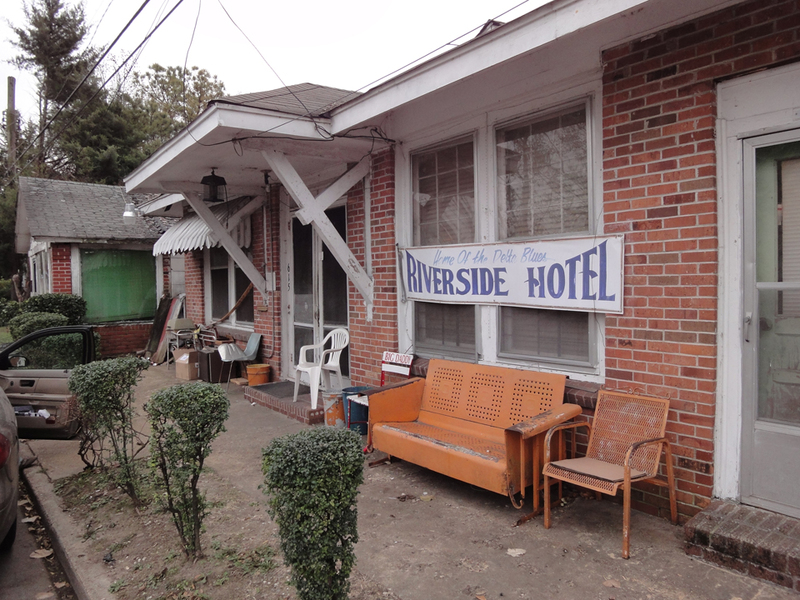 The Riverside Hotel and Robert Nighthawk’s suitcase « "TeresaBruceBooks"
Tupelo, Mississippi is the kind of town that looks lovelier at night, or under a light dusting of snow. Clarksdale, just two hours west, can’t be camouflaged. Its buildings have no heft, no angles to soften or drape. They’re mostly abandoned, sagging and scraping the streets, as dismal at dusk as dawn. But even Clarksdale is glamorous compared to Friar’s Point. A levee-side view of the Mississippi River and an official marker on the Blues Trail try, but fail to lift its spirits. It’s a mean kind of ugly, boarded up and half burned down just for spite. It boasts a museum that isn’t open for visitors and a son who couldn’t run away from it fast enough – blues legend Robert Nighthawk. He was in such a hurry to get to Chicago that he left his suitcase at the train station back in Clarksdale. A man named Rat still has it. He runs a hotel called Riverside, where Nighthawk spent his last night before the journey that would end in relative fame. Rat’s mother owned it back then. She’s the one who thought of turning the old black hospital in Clarksdale into a boarding house. It went from being known as the place where Bessie Smith died after her car crash, to the place where just about every blues musician on the circuit stayed. From Muddy Waters to the Blind Boys of Alabama, the greats made the Riverside their home away from home. Some still do – twice a year when the town’s juke joints swell with blues festivals. Regulars leave their personal items in the drawers of the well-worn bureaus in each room. When they come back, their stuff’s still waiting for them. Well, except for Robert Nighthawk. When he came back, Rat’s mother couldn’t remember where she had stashed away his suitcase for safe keeping. It was only after they both died that Rat found it. It’s in the back room now, just in case the spirit of Nighthawk ever pays a visit. This entry was posted in travel and tagged Riverside Hotel, Robert Nighthawk. As a half-Missippian ethnic, I have a gutfeel that Mississippi is a resting place for forgotten or lost suitcases. That is because I suspect that New Orleans is the city where lost valises are recovered, by and large, or thrown outight into the River. Mississippi is in so many ways a counterbalance for New Orleans, just as Alabama is the ballast tank between Mississippi and Georgia. I reckon suitcases are pretty safe in Alabama. What makes me think that is Demopolis. If you’ve ever been there, you’ll know why I said that. Mobile doesn’t count. Mobile is Florida.